Pipe freezing is an efficient way to seal a water pipe while repairs or maintenance are carried out. The compact freeze clamps have built in temperature gauges and have been designed to be fitted on clipped pipe close to walls. The ROFROST TURBO 28 can keep a pipe frozen for as long as needed and is an efficient alternative to freeze sprays. 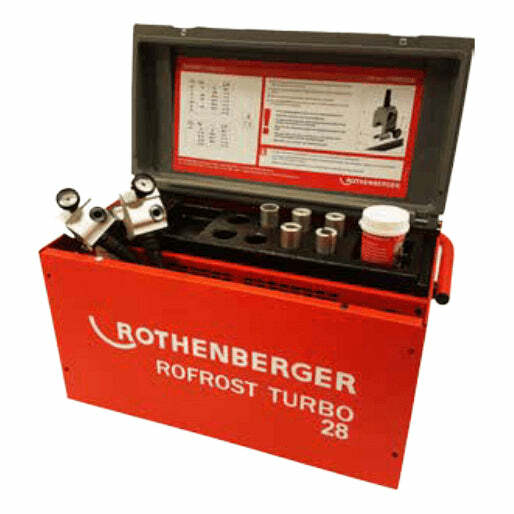 The ROFROST TURBO 28 is the latest model for rapid and reliable pipe freezing of domestic pipes (sizes 10-28mm). Also freezes steel pipe 1/4" - 1.1/4"